We all have a unique frame of reference that drives our perception of reality. Our perception of reality starts developing from the day we are born and continually evolves as we learn new information and gain experiences throughout our life. Although everyone is different, we have many things in common. This overlapping provides opportunities for connections. And, our connections provide opportunities for effective communication with others. Now let's explore where these perceptions come from. How our filters affect our perceptions of reality of the world. 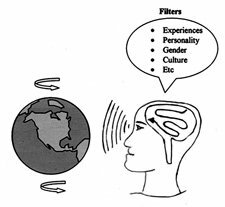 Every one of these factors creates a filter through which we view the world. The sum of these filters helps to create our unique perception of reality in which we use to make decisions, act, and react in a wide array of situations and circumstances. Our frame of reference is constantly changing as we learn, grow, become wiser and worldlier. And this continually changes our perception of reality. Even though each one of us has an exclusive perception of reality, we must interact, communicate, do business with and have meaningful relationships with others. Our communication skills must be flexible enough to accommodate many different perspectives and perceptions of realities if we are to be successful in communicating.With all the different factors to make us unique, the world becomes a fascinating place to live, but a difficult place to effectively communicate with others. Innocent words and statements are easily misinterpreted because we can’t always be aware of how others interpret what we are trying to communicate. Since we are all different, how do we communicate with others? * Do we use words and phrases that we clearly understand (our own language), but others may not? * Do we try and use the language of others, which we probably don’t know very well? * Do we use a combination of both? * Are there common threads that we should weave through all effective communication with others? Fortunately, there are some golden threads of effective communication. These threads are honesty, mutual respect, understanding, validation, compromise, appreciation, empathy and acceptance of others for their similarities to us as well as their differences. Apologizing and forgiving are also key threads to effective communication. Opening ourselves to different people and their individual ways of interacting and relating to others breaks down communication barriers. Investing the time to learn what makes others act and react a particular way helps us to communicate more efficiently. As our level of knowledge and experience increases, so does our ability to improve our effectiveness in interacting with people in general. Consider using The Six Thinking Hats to increase your frame of reference and see things from multiple view points.